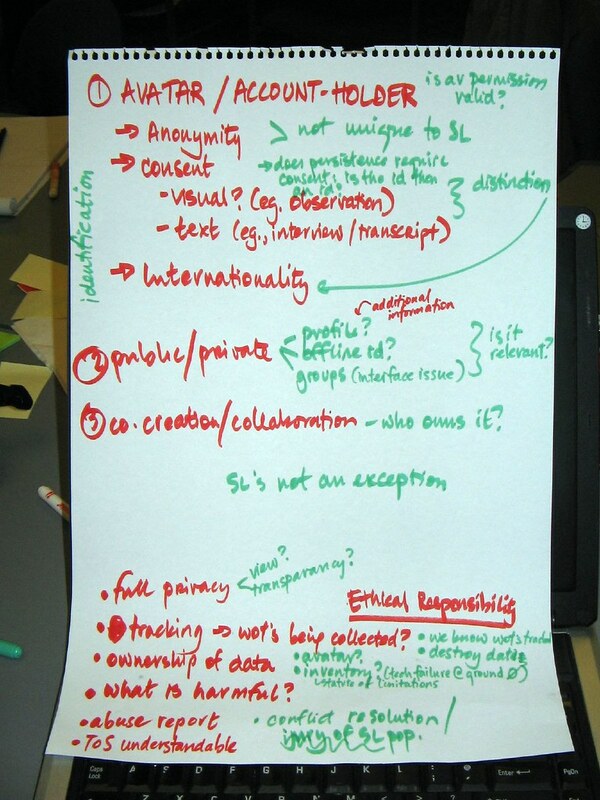 Group I: Consider the needs of the residents in the space – what are the perspectives of people: what’s public? What’s private? For example, a fetish isn’t something which requires ethical approval, but the person wearing fetish gear requires approval. Ownership – who owns it? When we sign up to participate in sl, you probably clicked “I accept” – what is it you’re accepting? Written in legalese: should be written at the 6th grade level, you can’t avoid seeing them; abuse reports: who should handle abuse reports? Conflict resolution? Co-creation and collaboration – who owns it? What happens if an individual decides to withdraw support? Sl has everything accessible to them and they analyse in real time; as a us entity, they have the legal authority to do that given their terms of service; are those conditions that ought to continue? Group IV: What constitutes a public space? It’s all private says Linden Lab because all private land is owned. But not all of it is private space, but there are spaces we think are public and people are acting in those spaces are public. What constitutes deceptive behaviour when most of us aren’t using our real names? Anonymity, attribution – when you attribute something to the av, can a person sign away consent via avatar? Important to remember, we have different social norms and cultural contexts: in Linden Lab – what they’re logging and retention, they’re transparent but should make clear what they retain – want to give away as much: need to make this as available to and legal to as large a group as possible – does this mean this is limited to Chinese restrictions of use and how they use data/government policy. Want easier way to giving informed consent: id people as people – anonymous informed consent is possible. would like those tools. Group V: Identifying how irb fits into the process: is it a true research environment because it’s a virtual community owned by Linden Lab? Avatars as anonymous? Are the non-identifiable to the real person? Linden Lab has a conflicted idea of what they want to do – vested interest in keeping rules that are in their interest. They still control it. 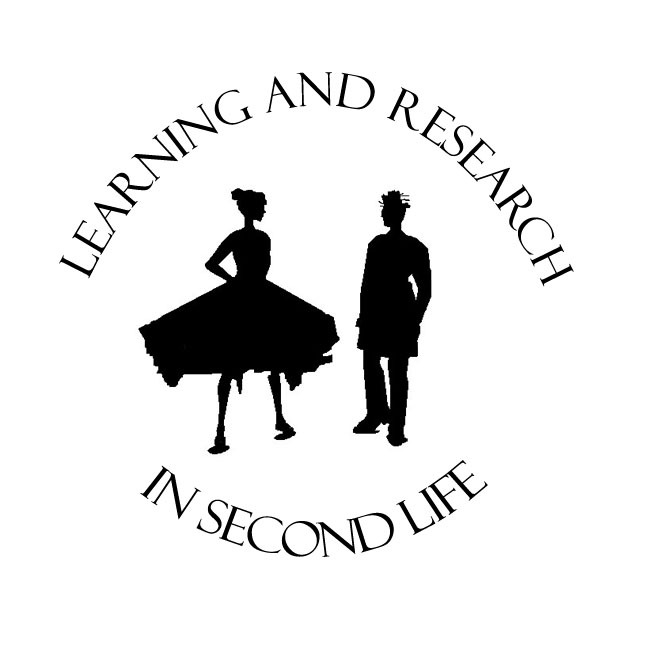 Group VI: “Research is encouraged.” There should be a policy of some kind, but Linden Lab shouldn’t try to be an irb. Guidelines: don’t need consent for de-id’d or aggregated data? Whether or not the forum is publicly accessible – no usernames, screenshots or other id unless have consent or it’s clearly a public event and the speaker is a public figure. Consequences for researchers who fail to meet the guidelines: hard (repercussions) or soft (taken up with the normal tos). More photos from the day are here. ~ by aleks on November 1, 2007.